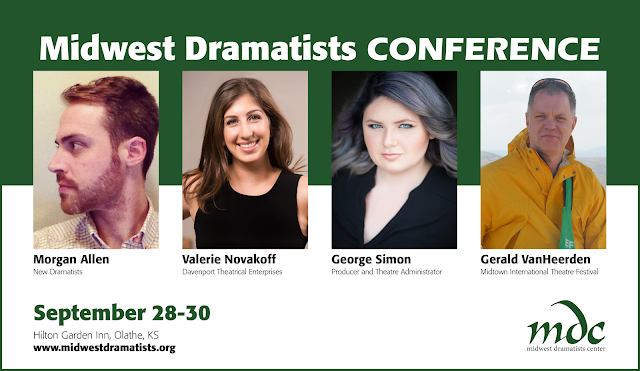 The Midwest Dramatists Center ('MDC”) is pleased to announce the first Midwest Dramatists Conference, to take place September 28-30, 2017. Join industry professionals from New York City, including Morgan Allen with New Dramatists, Valerie Novakoff with Davenport Theatrical Enterprises, Gerald VanHeerden with the Midtown International Theatre Festival, and producer and theatre administrator George Simon. Conference registration includes opening night reception, continental breakfast Friday and Saturday, a Gala dinner held Saturday night. More details about the conference will be announced at www.midwestdramatists.org. The conference will be held at the Hilton Garden Inn in Olathe, Kansas, 12080 S Strang Line Road. There is a special hotel discount for artists visiting from out of town. Please contact us if you need accommodations or help with transportation.